Adding a keyboard to your tablet set-up makes it easier to type, take notes in class and play games. If you have a tablet, why not try a keyboard? You’ll soon see how much more you can do when you connect a keyboard. When you use your tablet in class, it can be frustrating trying to take useful information down if you don’t have a keyboard. Working on the train when commuting to and from work is easier when you have a keyboard and it will cut down on embarrassing typos too. If you’re a gamer, check out our range of gaming keyboards that come with a host of extra features such as mechanical switches and extra buttons that you simply can’t get on a normal keyboard. If you play PC games, you can take your gaming experience to the next level when you add a specifically designed keyboard to your set-up. 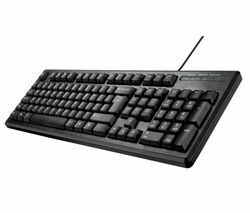 Keyboards come in all shapes and sizes, and they don’t need to break the bank as we have plenty of cheap keyboards for you to browse through. Our gaming keyboards are also great value for money, so be sure to check out the complete range if you’re looking to enhance your PC games. 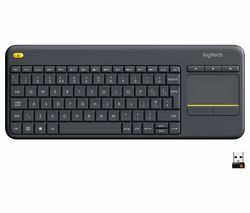 If you’re looking for a durable keyboard that won’t let you down, take a look at our range of Logitech keyboards. Whether you’re a gamer or a tablet user, adding a new keyboard will make a big difference.